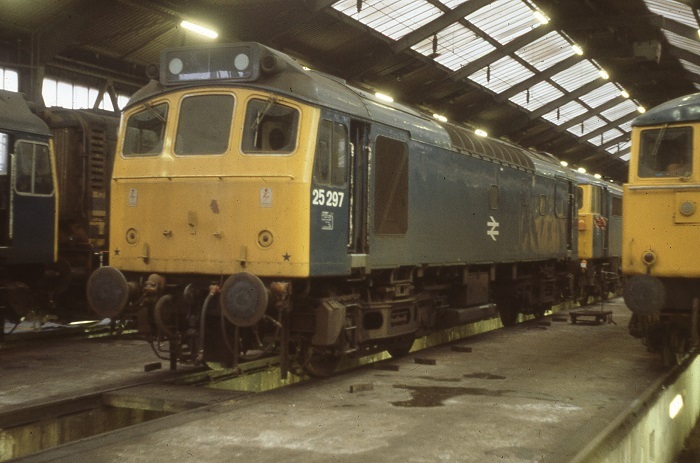 25297 at Willesden depot on December 22nd 1979. The twenty year five month service life for D7647/25297/25907 saw the locomotive allocated to London Midland Region depots apart from ten months allocated to the Eastern Region. Built: Beyer Peacock Ltd, Manchester (Works No. 8057). Time between last Classified repair and withdrawal: 96 months. Time between withdrawal & scrapping: 34 months. June 10th 1985 to unserviceable store. July 1985 reinstated to Crewe. 25907 was the 296th Class 25 withdrawn, one of seven retired during September 1986. Renumbered into TOPS December 15th 1973. Renumbered to 25907 November 26th 1985. After withdrawal 25907 was stored at Springs Branch until moved to Leicester Humberstone Road on May 24th 1989 and into Vic Berry's yard the next day. Scrapping was started sometime during June 1989 and completed by the middle of July 1989. Photograph courtesy Tom Sutch. 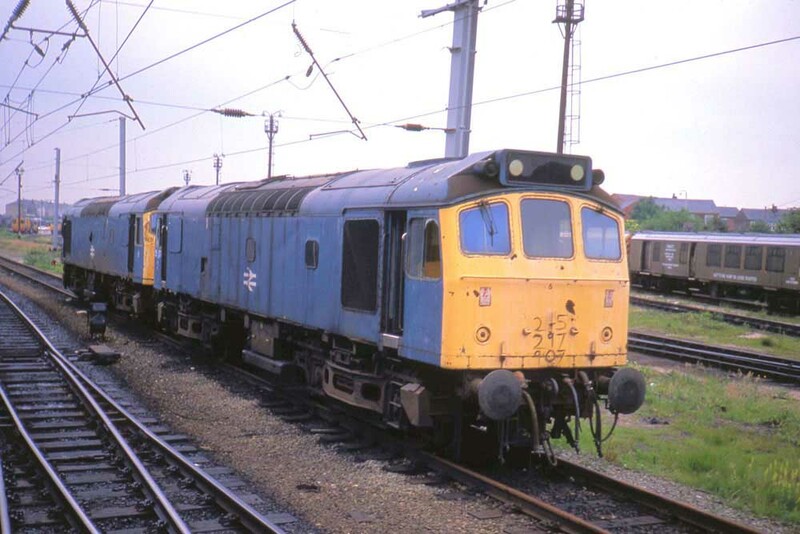 Four Class 25/9s were withdrawn during September 1986 including 25907 on 18th. On September 29th withdrawn 25907 strikes a fine portrait at Springs Branch. The extensive oil stains along the side of the locomotive are perhaps a clue to its demise. Noted Derby Works November 1969. 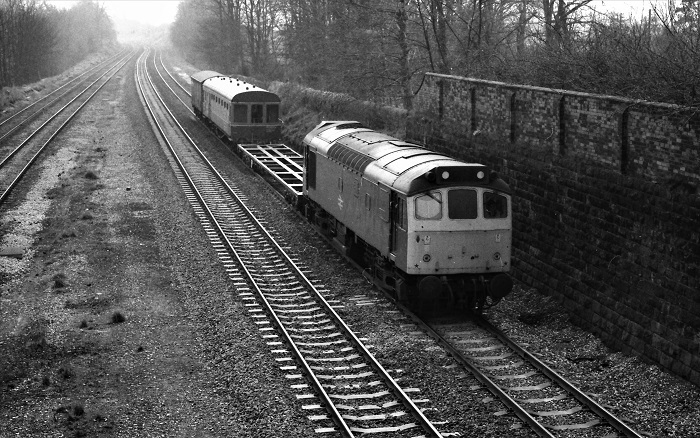 Noted Derby Works March 1972 (collision damage). 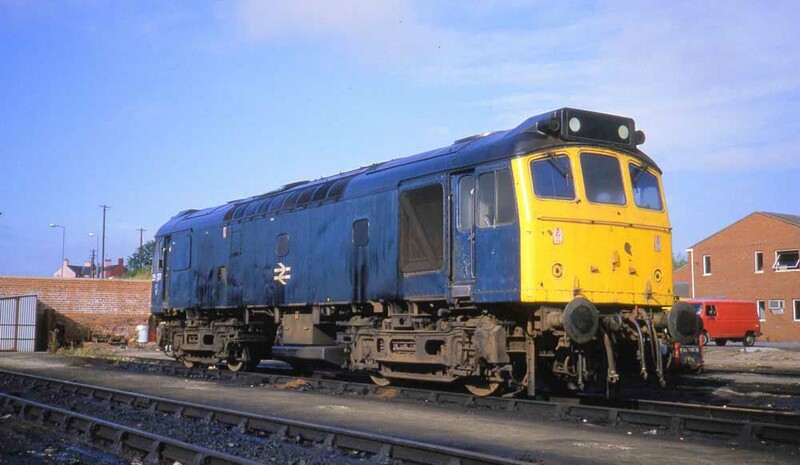 Noted Derby Works November 1973 (dual brake equipment fitted & received blue/yellow livery). Noted Derby Works August & September 1978 (Classified). 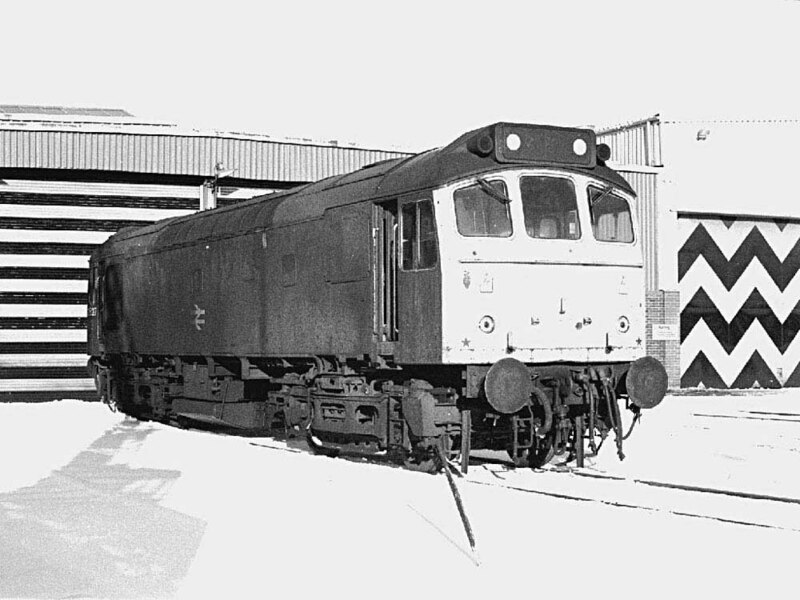 Noted Derby Works December 1982 (collision damage). The first recorded passenger working took place on July 30th 1966 with D7647 working the 09.28 Sheffield - Llandudno Town and 14.28 return. On February 7th whilst returning from Gosford Green D7647 became completely derailed on the approach to the mainline at Coventry. The locomotive and the first wagon were the only vehicles involved, in addition to the fuel tank being punctured the locomotive required re-railing using jacks because of the proximity of the overhead equipment. A rescue job on December 18th saw 7647 assist the 13.30 St. Pancras - Nottingham forward from Wellingborough after Class 45 No.91 failed. On June 10th 7647 worked the 06.20 Exeter St Davids - Barnstaple and the return 08.32 Barnstaple - Exeter St Davids. They later worked the 08.15 1B99 Paddington - Barnstaple forward from Exeter, returning with the 14.40 Barnstaple - Paddington to Exeter (see image below). Photograph courtesy Bernard Mills. 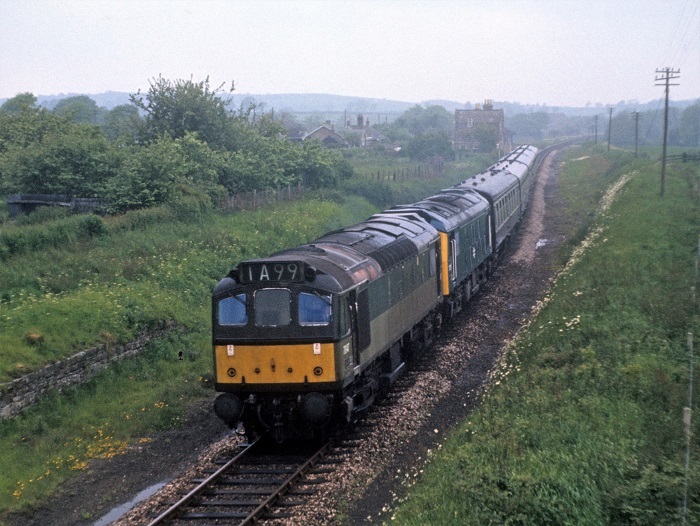 Class 25s 7647 & 7573 are near Morchard working the 14.40 Barnstaple - Paddington on June 10th 1972. On September 23rd 7647 & 5236 worked the 14.30 Yarmouth - Walsall from Norwich. On May 21st 7647 was noted in two-tone green livery with small yellow warning panels at Exeter, having arrived on the 7V61. On the late evening of May 25th 7647 was noted at Stafford. On June 23rd 7647 & 7592 worked the 08.00 Walsall - Yarmouth to Norwich. 25289 & 25297 were noted on a local Teesside trip workings on November 25th. The closure of Liverpool Exchange station on April 29th was marked by a special service to Lime Street via Wigan Wallgate, comprising ten coaches and buffet hauled by 47441. Departure was at 23.45, the stock having arrived behind 25297. It was a run up the North Wales coast with 25272 on May 29th with the 11.11 Manchester Victoria - Holyhead. The next day (30th) 25297 worked the 20.30 Crewe - Bangor and 22.45 Bangor - Llandudno Junction. 'The Woldsman' railtour on April 21st found 25297 & 25319 working the Liverpool - Guide Bridge leg out and back. Photograph courtesy Martin Margerrison. 25297 passes through Kegworth sometime during 1979. 25297 & 25289 were noted passing Hereford with an oil train on January 22nd. On May 12th electric multiple unit No.313059 was noted arriving at Healey Mills behind 25297 (for delivery to the London area? ), and being taken forward by 31105. On June 6th 25297 was noted between Kilwinning & Ardrossan with 20126 on a weedkilling train. The next day (7th) 25297 was noted on the same train at Langbank. A short working for 25297 on August 23rd was the 08.45 Manchester Victoria - Glasgow Central as far as Preston. The failure of 47528 at Derby on February 24th (or 25th?) 09.50 Edinburgh - Plymouth saw 25297 work the train forward to Birmingham New Street. Another failure, this time at Leicester on June 10th with 31297 on the 13.22 Norwich - Birmingham New Street saw 25297 take the train to its destination. During September 25297 received an 'E' examination at Springs Branch. Lets hope the passengers on the 20.52 Sheffield - Derby on June 5th enjoyed the ride behind 25297 & 25157. On July 20th 25297 worked the 19.30 Crewe - Cardiff forward from Shrewsbury. 25297 returned to this line on August 14th with the relief 15.50 Crewe - Cardiff. A Morecambe - Leeds service was worked on September 9th. Two days later (11th) 25297 handled the 22.47 Crewe - Preston. Photograph courtesy Tony Sayer. More wintry sunshine warms 25297 on a snowy January 10th 1982. Possibly 25297's first passenger working over the Cambrian line occurred on July 9th 1983 with 25327 on the 07.44 Shrewsbury - Aberystwyth, which was turned around at Machynlleth due to late running, returning as the 10.45 Machynlleth - Euston as far as Wolverhampton. On August 10th 25297 worked the 18.20 Glasgow Central - Manchester Victoria from Preston. August 15th proved to be a busy day for 25297, starting off with the 07.20 Blackpool North - Manchester Victoria, the 09.50 to Blackpool North and 12.45 return, the 17.15 to Blackpool North and 19.14 return and finally the 21.15 Manchester Victoria - Blackpool North, for a total of 288 passenger miles. On August 3rd 25297 & 37303 worked the 07.50 Earles Sidings (Hope) – Widnes. Photograph collection of webmaster. 25297 (25907) southbound at Warrington on September 13th 1983. A very short working took place on April 26th when electric multiple unit 304036 got into trouble on the 20.58 Walsall - Birmingham New Street, requiring the aid of 25297 fron Aston. It was back to the Cambrian line on September 15th with 254297 & 25259 on the 07.44 Shrewsbury - Aberystwyth and the return 10.10 Aberystwyth - Euston to Wolverhampton. 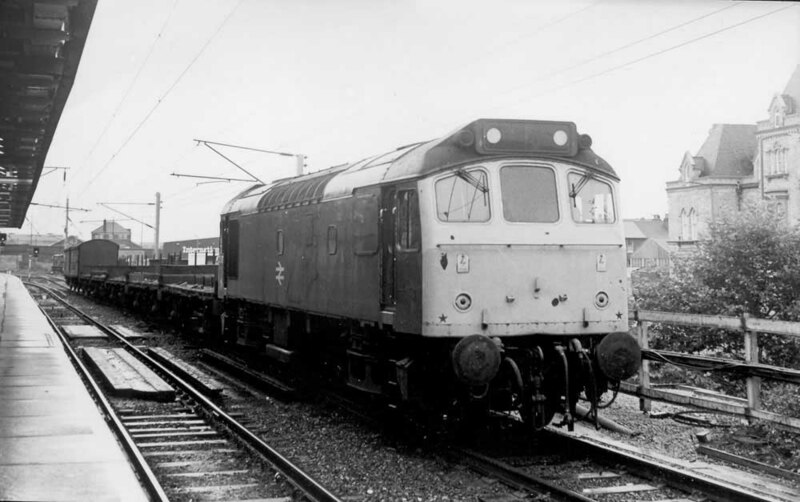 The afternoon Halewood – Whitemoor (later Dagenham) car train, a booked Class 47 turn occasionally featured Class 25s, so noted on May 8th was 25297. On June 9th 25297 & 25325 were noted northbound at Carstairs with bogie oil tanks (Stanlow - Bishopbriggs?). 25297 worked the Warrington - Middle Gates (North Wales) Speedlink on August 31st. 25297 was stabled at Speke on September 4th. The workings for 1985 started on February 25th with the 19.02 Manchester Piccadilly - Paddington requiring assistance from Stoke-on-Trent to Wolverhampton after the Class 86 failed. The 15.10 Bangor - Scarborough was assisted twice by 25297 during April 1985, on April 10th from Manchester Victoria to York after a Class 47 failed and on April 20th from Rhyl to Manchester Victoria after 45140 failed and was dragged to Manchester Victoria. Railtour duty occurred on October 12th 1985 with 25297 & 25268 working the F&W 'East Anglian Ltd' between Coventry & Liverpool Street. On reaching London, Stratford failed 25297 with defective brakeblocks and was replaced by 31144. Photograph courtesy Peter Lovell. 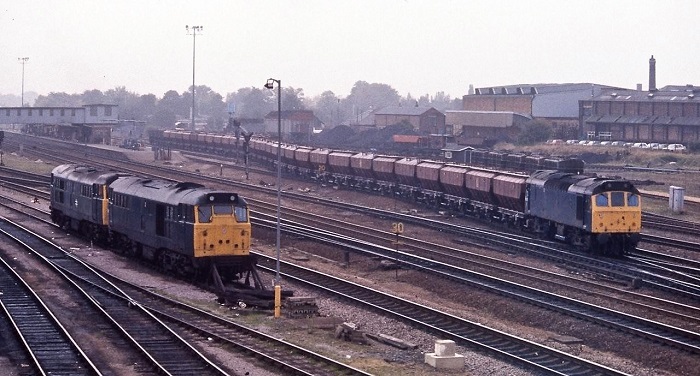 25297 at Peterborough on October 18th 1985 with a lengthy train of wagons. The 11.45 Stranraer – Tyne, frequently a Class 27 working was in the hands of 25907 on April 4th, returning with the 23.05 to Mossend. The 100th anniversary of the Mersey Railway was celebrated in early April. Part of the festivities included an Open Day at Birkenhead North depot on Sunday April 6th. Amongst the twelve diesel locomotives featured was 25907, 26027 & 33026. The final recorded passenger working took place on July 21st 1986, now as 25907 and with 25904 assisting the 07.30 Aberdeen - Penzance from Weaver Junction to Crewe after 85024 failed. Photograph courtesy Tom Sutch. Forlorn looking 25907 & 25254 wait for movement to a scrapyard, seen here at the south end of the depot on June 17th 1988. 25907 was withdrawn on September 18th 1986. No.2 cab front: multiple dents/areas of missing paint: on 2nd man's side above and below the handrail, towards the middle between the lamp brackets, driver's side lower down near the corner: at least 1979 until withdrawn. Page added June 28th 2013. Last updated February 18th 2019.